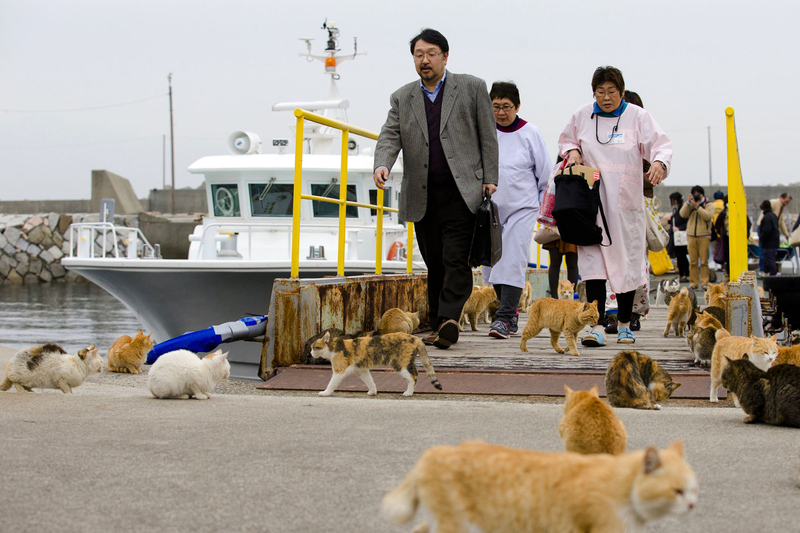 The sites include Amsterdam, Key West, the “cat islands” of Aoshima and Tashirojima in Japan, San Francisco (that’s bogus as it’s based on two cat cafes and a cat museum), Tampa, Florida, San Diego, California, Mykonos in Greece, Seattle, San Juan, Puerto Rico, and Malta. But one could go on much longer. Other cat towns I love include Paris, Plovdiv, Bulgaria (not on the water), and any village on the coast of the Peloponnese (just sit down at a seaside restaurant and they’ll come). And how the deuce could they forget Istanbul??? Here are two cat memes, the first sent by Heather Hastie and the second by reader Merilee. 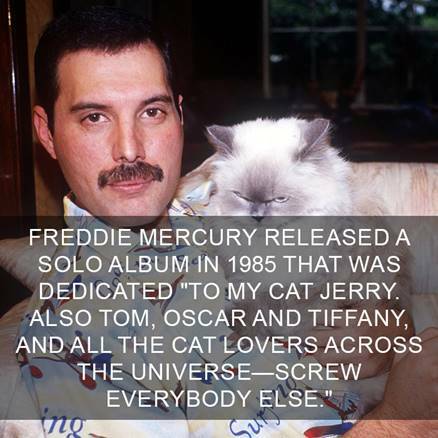 Note that Freddie Mercury had a cat named Jerry. If only he’d given it the last name “Coyne”! This is almost certainly posed, but who cares? The Chinese mountain cat is endemic to China and lives on the north-eastern edge of the Tibetan Plateau. It was recorded only in eastern Qinghai and north-western Sichuan. It inhabits high-elevation steppe grassland, alpine meadow, alpine shrubland and coniferous forest edges between 2,500 and 5,000 m (8,200 and 16,400 ft) elevation. It has not been confirmed in true desert or heavily forested mountains. 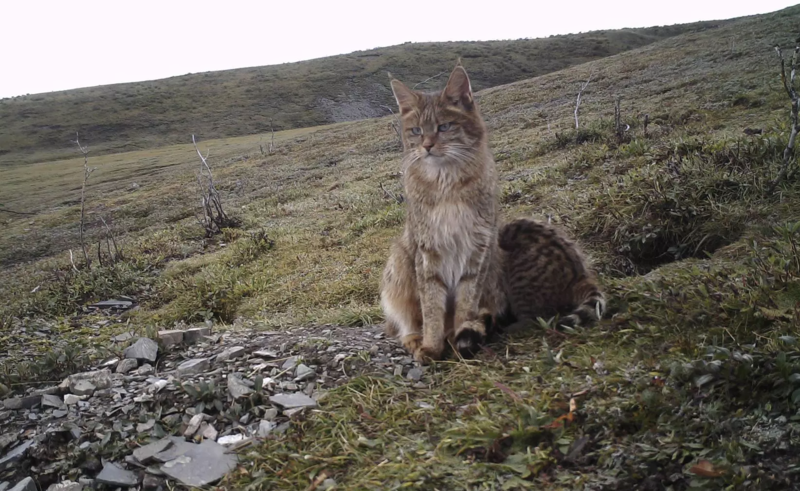 The first photographs of a wild Chinese mountain cat were taken by camera traps during light snow in May 2007 at 3,570 m (11,710 ft) altitude in Sichuan. These photographs were taken in rolling grasslands and brush-covered mountains. One individual was observed and photographed in May 2015 in the Ruoergai grasslands. In 2018, employees of the Shanshui Conservation Center found a den of a mother cat and her two kittens in Yushu, and captured them over three days using a camera trap. It was therefore with some excitement that I heard about the discovery of an active den while in the Valley of the Cats, near Yushu, in mid-September and was fortunate and privileged to be taken to the site by the finder, local ShanShui employee Dawa. Dawa had been working with Han Xuesong, ShanShui’s project lead on another Tibetan Plateau species – Black-necked Crane – when he spotted movement alongside the road. Thinking the animal was a Tibetan Fox, common in the area, he grabbed his camera and took a series of photographs. It was only when he later looked through the images that he realised he had photographed not a Tibetan Fox but a cat.. and after circulating the images to colleagues at ShanShui, it was soon confirmed as a Chinese Mountain Cat, a poorly known and rarely seen felid. On returning to the site, the ShanShui staff were delighted to find not one cat but three – a mother with two young kittens. They had found an active den – possibly the first ever discovered in the wild. The location, close to a road, meant that the cats appeared to be relatively used to seeing people and so, not long after, while the mother cat was away from the den hunting for prey, Dawa and Xuesong placed a camera trap close to one of the three entrances to the den (thought to be an old Himalayan Marmot hole). The resulting footage is spectacular and, courtesy of ShanShui Conservation Center, a compilation can be seen below. 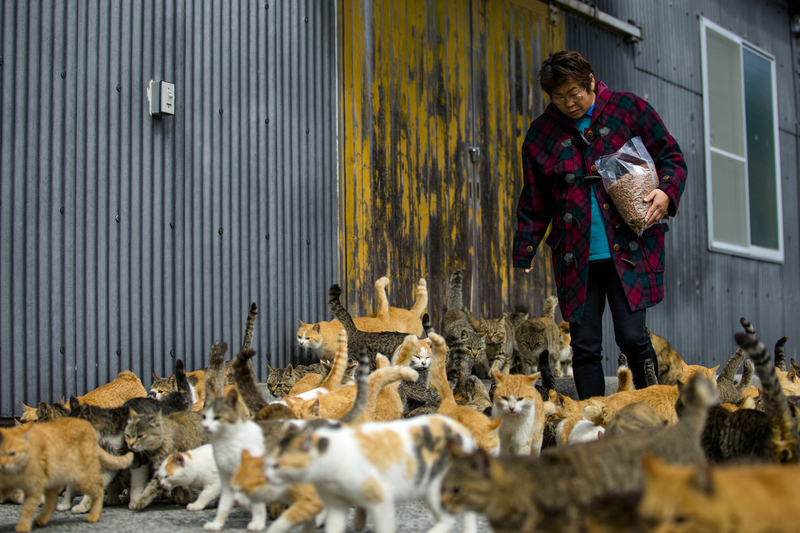 This entry was written by whyevolutionistrue and posted on October 20, 2018 at 10:30 am and filed under Caturday felids, felids. Bookmark the permalink. Follow any comments here with the RSS feed for this post. Both comments and trackbacks are currently closed. Or did I already see that on this blog? Another reason to love Freddie Mercury. When I lived in Tunis long ago, I rescued about five kittens who were trapped in a small utility room on the roof of my apartment building. I’d observed them for several weeks with their mother, but one day she didn’t return (probably met her demise), and I could tell they were very hungry and thirsty, so after climbing through a broken window with a pillow case five times, I was able to catch the little hissing and exploding firecrackers one by one — I sustained many cuts and scratches. I kept them to my bedroom room, just to feed them until they could survive on their own — they were completely feral, wouldn’t let me near them, hissed and spat at me. But at night, when I was asleep, they would creep out of their hiding places and line up on top of my prone body for warmth, just like the kittens on the dog, and I’d wake up to find the little balls purring or just sleeping. But at the slightest movement, they flew back to their nooks and crannies, to creep back again when I was still and all was quiet. My English leaves much to be desired today. I lived in Tunis (and Bizerte) for a bit but ultimately moved to a town outside of Beja called Sidi Bou Hedma (same as the park) and I too adopted a Tunisian critter. Lousia, a pregnant little d*g. The Tunisians don’t treat their d*gs well (they are looked down on by most) so Louisa was left to survive as best she could on the streets. But being a d*g she was eager to make friends with any who wanted and I was a push over. She was a sweet little girl but sadly not longer after her pups had been weaned she was killed by neighbor who objected to her presence. They don’t like d*gs in Tunisia. Aaaaw, Ms Haniver … … what a sweet story ! Orphans all ! And … … kittitarian that you were ! 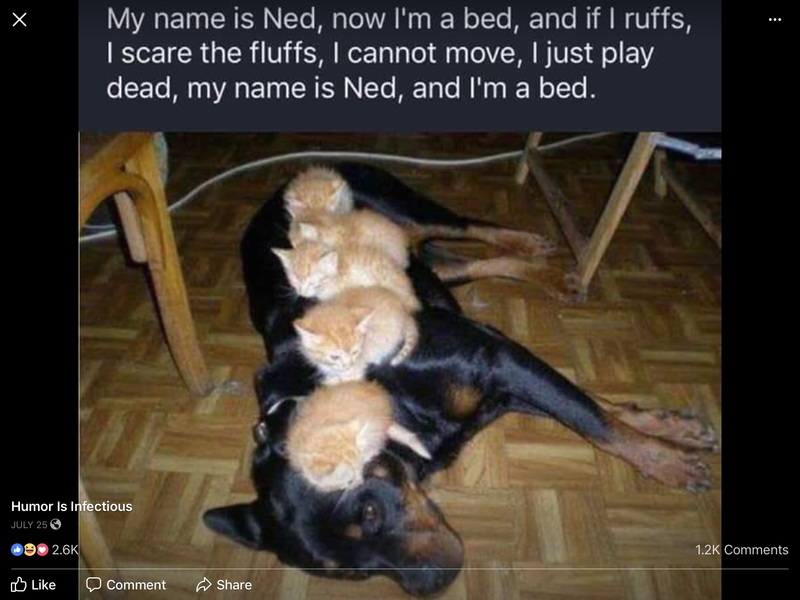 It’s as if the kitten closest to Ned’s ears is telling it’s siblings, “You guys are o.k., but Ned and me, we’re the real BFFs here”. 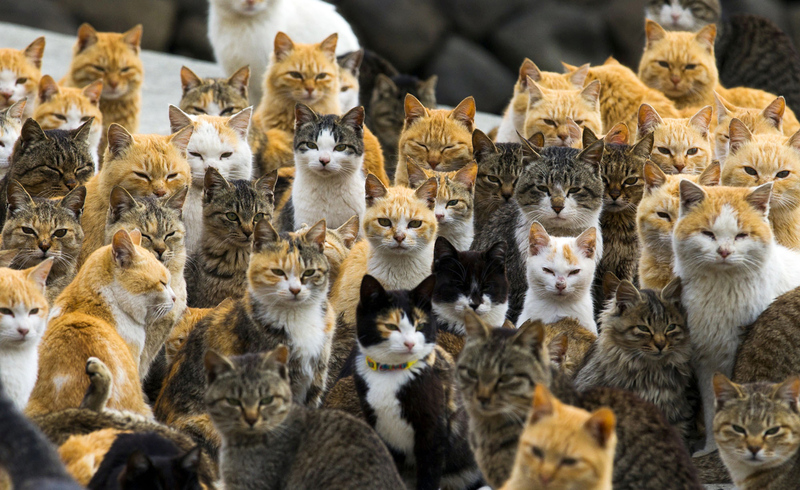 Isn’t it funny how all the cats look like different variations of each other? The Mountain Cat’s blue eyes are stunning! But is the Chinese Mountain Cat related to the elusive Gully Cat of the American West (as reported by van Pelt, L. and Schulz, C., https://www.gocomics.com/peanuts/2018/10/18)? The author COlette loved cats, and the movie “COlette” in theaters now starring Keira Knightley opens with a wonderful cat shot. There is a YouTube video of the real Colette with her cats here.